This question is front-and-center in the conversation surrounding education in Tennessee. This is the question ringing in classrooms across the state, the question plaguing teachers working tirelessly to adjust instruction to more rigorous expectations, striving to help students reach heights monumentally higher than they’ve ever been asked to, much less prepared to, before. This is the question of parents, nervous their children’s scores will not be as high as they’re accustomed to, worried that everything they’ve heard about the standards and Race to the Top and the over-testing is true, worried that the changes happening in our state may not be good for our children. This is the question of students whose target has been moved each year, who have been told TCAP counts as a grade (and that it doesn’t), that it’s the last year for TCAP tests (and that it’s not), and that now it is time for us to be TNReady. As a state, we have even branded our new test with a name that echoes our question—Are we ready? Are we TNReady? riel College has done the right thing not to remove the statue of Cecil Rhodes from its buildings at Oxford university. The “Rhodes Must Fall” campaigners have responded furiously to the decision to keep the imperialist in place, describing it as “outrageous, dishonest and cynical”. But thankfully — and despite an initial wobble over the matter — the college authorities have held firm. They have sent out an important message to academia and beyond over how we should view the past. Anger over the presence of Rhodes’ statue is understandable. He was a colonialist who began the policy of enforced racial segregation in South Africa. His presence on the college wall is bound to cause unease, not least because of the continuing lack of racial equality in British universities. Michael Thomasian, the principal of St. Anthony’s Catholic School in Brookland, was on his way to a dinner in Georgetown last night when his trip on Metro was brutally interrupted by a group of school children. Thomasian got on a Red Line train at the Brookland station around 4:40 p.m. yesterday to ride to Friendship Heights where a ride was waiting for him. At NoMa-Gallaudet, Thomasian says that a group of kids, all wearing khaki-colored pants, got on the train and surrounded him, yelling loudly while taking videos and pictures with their phones. Thomasian said that at Union Station, the kids began throwing snow and hit another rider in the face. “No one hit me, but they were totally in my space, sitting on top of the seats, three inches from my face,” he says. Should Los Angeles County Predict Which Children Will Become Criminals? One of the primary goals of Los Angeles County’s child welfare system is keeping kids out of lock-up. But in this pursuit, the county took a surprising step: It used a predictive analytics tool as part of a program to identify which specific kids might end up behind bars. Ortiz is stepping down from her post as dean for graduate education to found a new residential research university. Formally, Ortiz is taking a one-year leave from the Institute beginning after the end of the academic year, Chancellor Cynthia Barnhart PhD ’88 said in an email yesterday. Whether or not she actually returns to her materials science professorship in 2017, Ortiz said, will depend on the progress of the new university. YOUNGSTERS have long crossed borders in search of an education. More than 2,000 years ago the Roman poet Horace went to Athens to join Plato’s Academy. Oxford University admitted its first known international student, Emo of Friesland, in 1190. Today more than 4.5m students are enrolled in colleges and universities outside their own countries (see article). Their fees subsidise local students. Their ideas broaden and enliven classroom debate. Most go home with happy memories and valuable contacts, making them more likely in later life to do business with the country where they studied. Those who stay on use what they have learned to make themselves and their hosts wealthier, by finding work as doctors, engineers or in some other skilled career. Immigration policy is hard: Europe is tying itself in knots over how many Syrian refugees to admit. But the question of whether to welcome foreign students ought to be much easier. They more than pay their way. They add to the host country’s collective brainpower. And they are easy to assimilate. Indeed, for ageing rich countries seeking to import young workers to plug skills gaps and prop up wobbly pension systems, they are ideal. A foreign graduate from a local university is likely to be well-qualified, fluent in the local lingo and at ease with local customs. Countries should be vying to attract such people. What do we mean when we talk about ‘selective’ universities? Adopting language already in common use elsewhere, the Office for Fair Access (OFFA) has taken to calling those universities who admit the fewest students from low-income households the ‘selective’ universities. But what does ‘selective’ mean in this context? Is it accurate to apply the term only to those higher education institutions admitting more privileged students? What does it do to the broader perception – and perhaps, more importantly, the self-perception – of those students from poorer backgrounds when it is implied that they are not attending a ‘selective’ university? In the context of the recent Green Paper, where do the best prospects of driving social mobility lie? On Oct. 10, 2012, 11-year-old Colman Chadam was pulled out of class at his public middle school in Palo Alto, California, and asked if he wanted to say goodbye to his friends. According to Chadam’s parents, the teacher told him it was his last day at the school. Officials allegedly told the Chadams that the reason for their son’s dismissal involved his DNA: Colman had genetic markers associated with the rare disease cystic fibrosis — even though, James and Jennifer Chadam say, he is healthy and has never had the actual disease. The Chadams say that a teacher revealed this confidential information to other parents, who then complained that Colman posed a health risk to their children, inciting the Palo Alto Unified School District to force Colman to transfer schools, according to their complaint. Tap for a larger version (view the complete pdf slide presentation). I am astonished that the Madison School District’s administration published this chart. 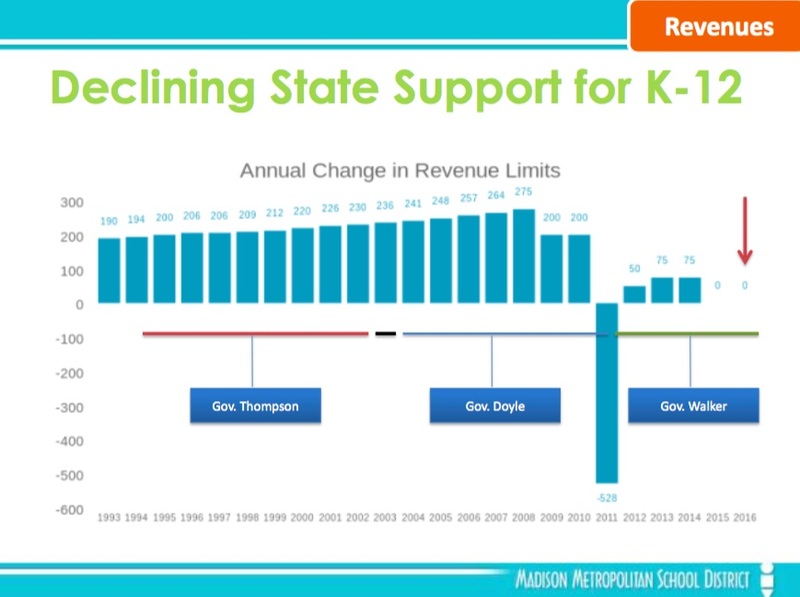 Why not publish the change in redistributed state (and federal) tax dollars over time as a percentage of total spending, along with academic outcomes? Further, this (PDF) enrollment document is a surprise after the community (small percentage voting) passed a rather large facility expansion referendum in early 2015. These funds include the expansion of Madison’s least diverse school: Hamilton Middle School. Wisconsin’s Department of Public Instruction, along with the Wisconsin Center for Educational Research and the Institute for Research on Poverty at the University of Wisconsin-Madison, have received a four-year, $5.25 million grant to advance the work of DPI’s Promoting Excellence for All initiative. This new grant will allow DPI to further study Wisconsin schools with promising practices for reducing gaps, and determine to what extent those practices can be replicated in other locations. Perhaps this will lead to more meaty specificity on the website, where the current strategies are general and aspirational in nature. Although Wisconsin posts some of the largest performance gaps in the country, it does not appear that DPI will be looking beyond the borders of our state for possible solutions. Media outlets have been reporting on the grant as well as reflecting on the disgraceful size of the gaps in Wisconsin and the lack of progress in narrowing them. It will be important to remember that some very worthy practices, such as explicit and sequential teaching of foundational reading skills, may raise the performance of the low groups of students without appreciably narrowing the gap. That is because the same instructional practices that benefit the students at the bottom also benefit the students at the top, raising all ships. A bi-lingual song penned by a talented Irish teenager to highlight the plight of children living in poverty has sent shivers down our spines. 16-year old Transition Year student Róisín Seoige from Galway has won the PREDA song contest for her beautiful tune ‘Freedom Song’. PREDA is a charity which provides aid to children living in poverty in the Philippines and the work they do inspired Róisín’s powerful song. Irish singer songwriter and PREDA advocate Damien Dempsey has commended her talent, saying he was overcome with emotion because “this young songwriter truly connected with the plight of the children”. And we’re not far behind. Róisín’s melodious voice conveys a depth of emotion far beyond her years and it has really touched a chord (pardon the pun!) with us here. Lumosity, the heavily advertised “brain training” program, will pay $2 million to settle deceptive advertising charges brought by the Bureau of Consumer Protection of the Federal Trade Commission. The company must notify subscribers of their right to cancel their subscriptions. America may be the land of the free, but the two leading contenders for the title of “great American novel” actually take place on the water. For Melville, the ocean contained all of humanity’s great secrets (and metaphors); but for Twain, it was the water itself that was the key. 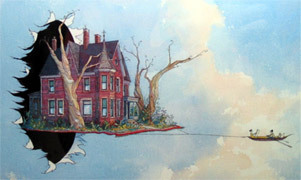 In Adventures of Huckleberry Finn, the river is both the setting of the novel and its central theme. And the fact that it also paved the way (so to speak) for the American road movie is just an added bonus. A new study argues that student evaluations are systematically biased against women — so much so, in fact, that they’re better mirrors of gender bias than of what they are supposed to be measuring: teaching quality. Anne Boring, an economist and the lead author of the paper, was hired by her university in Paris, Sciences Po, to conduct quantitative analysis of gender bias. Through her conversations with instructors and students, she became suspicious of what she calls “double standards” applying to male and female instructors. The Chicago Public Schools on Wednesday abruptly put off $875 million in borrowing needed to ease its financial crunch amid signs it would pay a heavy price — in the form of record-high interest rates — to attract investors. The City of Chicago’s chief financial officer, Carole Brown, and CPS financial chief Ron DeNard tried to put the best possible face on the decision to postpone the bond sale one day after a preliminary interest rate of 7.7 percent was sent out to investors. As MSRP enters its 7th year, Rep. Joe Sanfelippo has proposed legislation that would provide $1.1 million for the program over two years. The six-week summer program for Milwaukee students exiting 1st and 2nd grades has seen student scores rise significantly. Dr. Howard Fuller, who spearheaded MSRP, credits much of the success to intensive training of its teachers with Language Essentials for Teachers of Reading and Spelling (LETRS). A fourth cohort of educators, including teachers, tutors, and coaches from the community, will start LETRS training in March. With the outcome of the legislation uncertain, Fuller will continue to rely on the generosity of local foundations to fund MSRP. IFERI: The International Foundation for Effective Reading Instruction website is an excellent resource with input from leading researchers and advocates. This follows a 2012 study in Gaab’s lab where MRI’s showed left hemisphere differences in brains of pre-reader kindergartners with a familial history of dyslexia. Implications for early intervention are discussed. Today is the 200th anniversary of the birth of George Boole. In our modern digital world, we’re always hearing about “Boolean variables”—1 or 0, true or false. And one might think, “What a trivial idea! Why did someone even explicitly need to invent it?” But as is so often the case, there’s a deeper story—for Boolean variables were really just a side effect of an important intellectual advance that George Boole made. Loud and clear: Data Scientist Training for Librarians (DST4L) is a wonderful concept. It’s an experimental course developed at Harvard-Smithsonian Center for Astrophysics Library with the aim to train librarians to respond to the growing data needs of there communities. We all know the story: The Internet happened and the amount of information and data exploded. And it’s right in front of everybody’s nose – the neighbor kid as well as the scholar. Information and data in any form is the building bricks of science and knowledge and with the rapid increase of these the need to gain tools and skills to tame and analyze them grow. This development has changed the way academia works and when academia changes the library should pay attention and think of it’s options. One of a chief executive’s most important roles is communication, which often means public speaking to very large groups. But it’s not easy to get everyone’s attention. What’s the best way to keep audiences informed, engaged and inspired? 14-1-5.2. Age restrictions for children. – (a) Children under ten (10) years of age shall not be left home alone. (b) Children at least ten (10) years of age and not more than twelve (12) years of age shall be allowed to stay home alone for brief periods of time, but not after 9:00 pm. (c) Children over twelve (12) years of age may be left home alone, but not overnight. (d) Parents and legal guardians should use their judgment to access the maturity and responsibility of their children and to discuss safety procedures and precautions before deciding whether to leave their child(ren) home alone. expanding school choice. I think it’s the right thing to do for kids, families, educators, neighborhoods, civil society, and much else. In fact, I’m convinced that years from now, students of history will be scandalized to learn that we used to have a K–12 system defined by one government provider in each geographic area. But probably the most important lesson I’ve learned over the last fifteen years—the reason why school choice progress moves so slowly—is this: An education system without school choice makes perfect sense from the point of view of central administrators. In fact, the district-based system (a single public sector operator of schools) that we’ve had for the last century is extraordinarily rational when viewed from above. A city has lots of kids, and those kids need to be educated. A central schooling authority will take care of it. recently launched Spying on Students—an online resource dedicated to helping students, parents, teachers, and school administrators learn more about the privacy issues surrounding school-issued devices and cloud services. The website—part of our new campaign to promote student privacy—provides useful guides for adjusting privacy settings on mobile devices. It also answers common questions about the legal and technological landscape regarding student privacy and offers suggestions on how you can connect with other concerned parents. AFTER Aida Hadzialic’s parents fled war-torn Bosnia for Sweden in the early 1990s, they put their five-year-old daughter in a school full of native Swedes and made sure she studied hard to get ahead. It worked. Today Ms Hadzialic, 27, is Sweden’s minister for upper secondary education. Like her counterparts across Europe, she faces a new challenge: ensuring that a fresh wave of refugee children can integrate as successfully as she did. Even before this year’s surge, western Europe had lots of immigrant students. According to the Organisation for Economic Cooperation and Development (OECD), the proportion of 15-year-old schoolchildren in Spain who are foreign-born rose from 3% to 8% from 2003 to 2012 (though in Germany it fell by about the same amount). The new wave of migrants from Syria, Afghanistan, Iraq and elsewhere has redoubled the strains on school systems. Nearly half of young black men in Chicago are neither in school nor working, far exceeding the share nationally and in comparable big cities, according to a new report. Forty-seven percent of 20- to 24-year-old black men in Chicago, and 44 percent in Illinois, were out of school and out of work in 2014, according to the report from the University of Illinois at Chicago’s Great Cities Institute that was commissioned by the Alternative Schools Network. Related: Madison’s long-term, disastrous reading results. A new report has been released by the National Council on Teacher Quality: Learning About Learning: What Every New Teacher Needs to Know. In terms of instructional strategies that help students learn and retain new concepts, a lot was found missing from textbooks currently used to train teachers. Congratulations to the Children’s Dyslexia Center-Madison on opening four new classrooms! The expansion was made possible by the Scottish Rite Masons and the Madison community. The OSP is an effort to make the intellectual judgment embedded in syllabi relevant to broader explorations of teaching, publishing, and intellectual history. The project has collected over 1 million syllabi, has extracted citations and other metadata from them, and is now pleased to make the Syllabus Explorer publicly available as a means of exploring this corpus. Looking ahead, the OSP’s goal is to expand the collection and make it more useful to authors, teachers, administrators, and students. To understand the context of current research, it is essential to understand how current results evolved from early fundamental papers. These classic papers develop timeless ideas that transcend technology changes, and the ideas embodied in their solutions often apply to current problems (and, indeed, are reinvented by researchers who are ignorant of the classic literature). the roster of history’s intellectual and artistic giants, and you quickly notice something remarkable: Many were immigrants or refugees, from Victor Hugo, W.H. Auden and Vladimir Nabokov to Nikolas Tesla, Marie Curie and Sigmund Freud. At the top of this pantheon sits the genius’s genius: Einstein. His “miracle year” of 1905, when he published no fewer than four groundbreaking scientific papers, occurred after he had emigrated from Germany to Switzerland. In the 2011 movie Limitless, our loser-turned-hero Bradley Cooper takes a pill, writes a novel in a few days, becomes an investment tycoon, and performs other tricks of mental derring-do. And of course at the end of the movie (spoiler alert! ), he gets the girl. If only such a pill really existed. Well, it may. Sort of. Welcome to the world of nootropics, or smart drugs. Nootropics (derived from Greek words that mean to bend the mind) are categories of drugs, supplements and other additives and stimulants that enhance memory, cognitive function and even intelligence. For thousands of years, humankind has sought ways to improve the mind, and many believe that modern science is on the cusp of achieving that goal, albeit with many caveats. Are you interested in how Wisconsin 4th graders’ reading performance stacks up against other 4th graders nationwide? The National Assessment of Education Progress (NAEP), administered every two years, is the one way we can get answers. 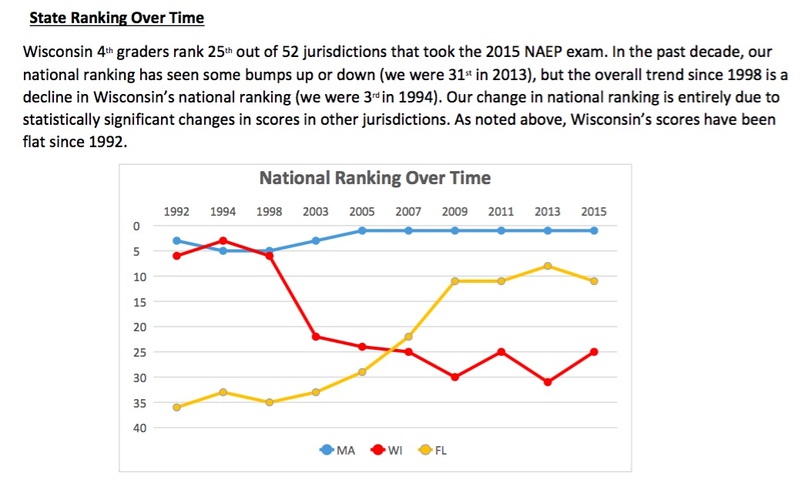 See the attached document for the results from the 2015 NAEP, including our current and historical national ranking and how subgroups of Wisconsin students compare to each other as well as to their peers in higher performing states. The first step in improving outcomes is always to be knowledgeable and honest about our current performance. Much more, here (PDF Commentary). Wisconsin’s long serving WKCE exam was often criticized for its low standards. The Badger Exam lasted just one year, to be replaced this spring with the Wisconsin Forward Exam. Wisconsin contracted with Data Recognition Corporation (DRC) to develop the new test with input from Wisconsin teachers. In addition to rolling out the new assessment, DPI must complete the important process of setting proficiency standards. We hope they will continue to set proficiency cut scores based on the NAEP standards. For many years, Wisconsin yielded to the temptation to set its standards low, making it appear that we had higher percentages of proficient students than was actually the case. 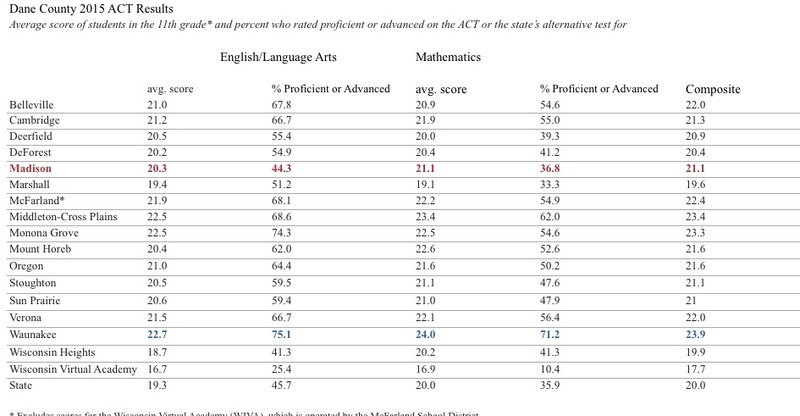 As reported by the Wisconsin Policy Research Institute, the required level for proficiency in 4th grade reading in Wisconsin was actually below the level that NAEP set for the basic performance category. “In this report, which involved mapping state proficiency standards in reading and mathematics onto the appropriate NAEP scale (2004-05), Wisconsin was among the states at the lower levels. DPI has also been asked by the U.S. Department of Education with finding a way to increase the number of students taking the statewide assessment. Wisconsin was one of 12 states that had a lower-than-required participation rate last year. A letter from the Department of Education spelled out the requirements as well as listing possible strategies to achieve compliance from districts. Badger Exam results; Madison Substantially Lags State Results…. For the fourth year, the Milwaukee Summer Reading Project will offer free training in Language Essentials for Teachers of Reading and Spelling (LETRS) in Milwaukee. Ten Saturday classes run from March into June. There are approximately ten open spots, with registration being first come-first served. If you are interested, please reply to this email to receive detailed information. For 2014-15, the Badger Exam was Wisconsin’s annual statewide test in English Language Arts, taking the place of the WKCE. Badger was the name used in Wisconsin for the assessment developed by the Smarter Balanced Assessment Consortium (SBAC), one of two Common Core-aligned assessments utilized by multiple states. As is true in the NAEP data, the Badger scores reflect deep and persistent gaps between different groups of students. Proficiency percentages were only 20.2 for African-American fourth graders, 24.3 for students with disabilities, and 37.1 for low income students. DPI’s press release contains details. The Badger exam is now history in Wisconsin. Legislation required development of the new Forward exam for this year. Since we will not longer be able to compare scores with other states who are taking the SBAC exam, it is critical that Wisconsin be honest about setting its proficiency cut scores at a level that corresponds to the NAEP standards. 2015 data via a .xlsx, .numbers file or PDF. Milwaukee School District Slides (PDF). Wisconsin’s long serving WKCE exam was oft criticized for very low standards. Madison has long tolerated disastrous reading results, despite spending more the $17,000 per student annually. Decades of bleak results from kids’ standardized tests now seem almost routine, but a new study made public Tuesday scratches beneath the surface to pin down just how many students in major U.S. metropolitan areas can actually read or do math proficiently. The results: Startlingly few. If all of Detroit’s fourth-graders took the well-respected National Assessment of Educational Progress (NAEP) tests, just 120 African-American fourth-graders across the entire city, by researchers’ estimates, would score “proficient” or above in math. “This is not a misprint,” the authors warn. Madison has long tolerated disastrous reading scores. I recently got into an argument with an Average Twelve-Year-Old (ATYO) about language and Instagram, an argument which, I have to admit, is semi-signalling to me the end of the world. When a teen posts a cute picture of, say, a puppy or a baby brother on the photo-sharing app, other teens invariably comment “awe”. I pointed out to the ATYO that they really mean “awww” and that “awe” actually means “an overwhelming feeling of reverence, admiration, fear or wonder produced by that which is grand, sublime, extremely powerful”. She seemed unimpressed by the distinction. If there is a difference between God and a cute puppy it’s uninteresting to her. Continuing in this vein, I said that all the kids commenting on Instagram and using “artsy” as a great compliment were misusing that word — “artsy” actually being a negative term meaning pretentious or fake or trying too hard to seem artistic. The ATYO looked at me with the pity one might feel towards a tourist struggling to read a menu in a strange land: “That’s not what it means on Instagram.” I realised, to my horror, that she was right. The words, as I and the Oxford English Dictionary understood them, were rapidly vanishing into the world of Instagram and its 400 million users, in which “awe” is about puppies, and “artsiness”, skilfully filtered, is vastly preferable to art. The Nicoya peninsula in northwestern Costa Rica is one of the most beautiful places on the planet. This 75-mile sliver of land, just south of the Nicaraguan border, is covered with cattle pastures and tropical rain forests that stretch down to the crashing waves of the Pacific Ocean. The coastline is dotted with enclaves of expats who fill their time surfing, learning yoga and meditating on the beach. For the locals, life is not so idyllic. They live in small, rural villages with limited access to basics such as electricity, linked by rough tracks that are dusty in the dry season and often impassable when it rains. The men earn a living by fishing and farming, or work as laborers or sabaneros (cowboys on huge cattle ranches), while the women cook on wood-burning stoves. Yet Nicoyans have a surprising claim to fame that is attracting the attention of scientists from around the world. Spelling, punctuation and grammar: can you outsmart an 11 year old? Minnesota’s foster care system is falling short of state and federal standards meant to ensure that abused children are placed into stable and permanent homes, a Star Tribune review of state records has found. Those records reveal that too many abused foster children in Minnesota are returned to their parents too quickly, suffer more maltreatment and end up back in foster care. Thousands of children have been further traumatized by being shuttled among numerous foster homes as they wait, sometimes in vain, for adoption, state records show. As the number of foster children has grown to more than 11,000, fewer families are signing on as foster parents, records show. That problem could intensify, as a child protection task force formed by Gov. Mark Dayton recommended on Monday numerous reforms that will likely see more children removed from abusive homes. “I don’t think we’re ready for that increase,” Robert O’Connor, a member of the task force and a social work professor at Metropolitan State University, said after reviewing the data compiled by the Star Tribune. Can 15-year-old Wikipedia remain the planet’s font of all knowledge? This month, Wikipedia officially celebrates 15 years as the internet’s free encyclopedia, cataloguing humankind’s achievements in real time and, more importantly, rescuing desperate students facing assignment deadlines. In that time, it has hastened the end of Microsoft’s Encarta encyclopedia and supplanted Britannica as the dominant reference work in English. While the digital landscape has changed drastically over the past decade, Wikipedia has not, and still delivers that rare site that strives for neutrality and accuracy, all with no commercial advertisements. It’s hard to overstate how influential Wikipedia has been, not just as a free alternative to traditional knowledge sources, but as a vanguard for maintaining and delivering up-to-date information. Each month, nearly 100,000 volunteers around the world actively contribute content to Wikipedia so that anyone may freely read, copy or redistribute its articles. Dr James Heilman, a Canadian emergency room doctor and a volunteer Wikipedia editor, found that it was the most turned-to source of information on the internet during the height of the recent Ebola outbreak in West Africa. In the Journal of Medical Internet Research, he noted, “Wikipedia appears to be the single most used website for health information globally, exceeding traffic observed at the National Institutes of Health, WebMD and the World Health Organisation.” With substantial editions in more than 100 languages, it has become a critical educational resource in emerging markets ignored by traditional publishers. THE world of “The Hunger Games” youngsters are forced to fight to the death for the amusement of their white-haired rulers. Today’s teen fiction is relentlessly dystopian, but the gap between fantasy and reality is often narrower than you might think. The older generation may not resort to outright murder but, as our special report this week on millennials describes (see article), in important ways they hold their juniors down. Roughly a quarter of the world’s people—some 1.8 billion—have turned 15 but not yet reached 30. In many ways, they are the luckiest group of young adults ever to have existed. They are richer than any previous generation, and live in a world without smallpox or Mao Zedong. They are the best-educated generation ever—Haitians today spend longer in school than Italians did in 1960. Thanks to all that extra learning and to better nutrition, they are also more intelligent than their elders. If they are female or gay, they enjoy greater freedom in more countries than their predecessors would have thought possible. And they can look forward to improvements in technology that will, say, enable many of them to live well past 100. So what, exactly, are they complaining about? New study suggests the SAT may over- or underpredict first-year college grades of hundreds of thousands of students. College Board has claimed for decades that the SAT’s strength is that it predicts the grades students will earn in the first year of college. But what if, in many cases, it doesn’t? A study released Monday suggests that hundreds of thousands of students a year may have SAT scores that predict they will receive either better or worse grades than they are actually likely to receive. While the SAT may predict accurately for many others, the scholars who have produced the new study say it raises questions about the fairness and reliability of the SAT (including the new version about to be unveiled), which remains a key part of the admissions process at many colleges and universities. Most rights can be voluntarily abandoned (“waived”) by the owner of the rights. Legislators can go to extra effort to create rights that can’t be abandoned, but usually they don’t do this. It is well settled that rights gained under the Copyright Act may be abandoned. But abandonment of a right must be manifested by some overt act indicating an intention to abandon that right. See Hampton v. Paramount Pictures Corp., 279 F.2d 100, 104 (9th Cir. 1960). arithmetic mean of a, b, and c. A different kind of mean, however, uses the product of these numbers instead of their sum. It is called the geometric mean and is given by the expression (abc)1/3. We may interpret the geometric mean of nonnegative a, b, and c as the side length of a cube whose volume is the same as that of a right rectangular prism with dimensions a, b, and c.
In NCTM’s Focus in High School Mathematics: Reasoning and Sense Making in Algebra (2010), Graham, Cuoco, and Zimmermann use similar triangles and angles inscribed in circles to prove that, for two nonnegative numbers a and b, the arithmetic mean is greater than or equal to the geo- metric mean. Symbolically, this is written as (a + b)/2 ≥ (ab)1/2. This fact, called the inequality of arithmetic and geometric means (AGM), is actu- ally true for any number of nonnegative values. For three nonnegative numbers a, b, and c, for instance, we have (a + b + c)/3 ≥ (abc)1/3. On a recent, chilly Sunday morning, children ranging in age from 4 to 6 waited with their parents in the cafeteria of a Brooklyn school. Each wore a name tag. The kids chatted cheerfully (in several languages) until each was summoned upstairs to be tested for a spot in New York City’s gifted program. Their parents sent them off with hugs and the promise of special treats for doing their best. When a student is identified as “gifted,” the label is a vote of confidence — as in the indelible Nina Simone song. It also comes with a prize package: extra services, accelerated classes, individualized learning plans. The availability of these services varies widely from district to district. The chances of being identified as gifted also varies — notably, by race. Social contact can clearly spread disease: That’s why we lean away from snotty hugs, tell sick colleagues to go home, and quarantine people during epidemics. But the germs behind infectious illnesses are but a tiny fraction of our full microbiome—the microbes that share our bodies. Most of these are harmless, perhaps even helpful. And they can hop between individuals, too. A growing number of studies, including two recent ones with chimps and baboons, have shown that social interactions affect the composition of the microbiome. Through hugs, handshakes, and even hip-checks, we translate our social networks into microbial ones, transferring benign or beneficial microbes to our neighbors, and acquiring theirs in return. This means that there’s a “pan-microbiome”—a meta-community of microbe species that spans a group of hosts. If you compare your microbiome to your private music collection, the pan-microbiome is like the full iTunes store, and every handshake is an act of file-sharing. Within the past few years board games have gone through an explosion of growth. In 2012 The Guardian went as far as dubbing it “A Golden Age for Board Games”, stating board games have seen a growth rate as high as 40% year over year. It’s also quickly becoming one of Kickstarter’s most funded project categories. The budding interest has gone as far as inspiring Wil Wheaton and Felicia Day to start a popular Youtube series, called Table Top. This series pits internet celebrities against each other and garners several hundred thousand views per video. So, how did something so archaic become so popular? Where did it all start? You know how it’s supposed to work: A scientist should ideally be able to do the same experiment as any other scientist and get similar results. As researchers check and recheck each other’s findings, the sphere of knowledge expands. Replication is the path to scientific advancement. Some 15 million researchers published more than 25 million scientific papers between 1996 and 2011. Among them were several casting doubt on the veracity and reliability of the rest—suggesting that even studies published in gold-standard journals by researchers from top-tier institutions are far more likely than anyone previously realized to be false, fudged, or flukey. The upshot is that many researchers have come to believe that science is badly battered, if not broken. In September, Auburn University’s football stadium debuted one of the largest video boards in North America. At just shy of 11,000 square feet, the high-definition screen is roughly the size of a five-story building. During a test one night this summer, the glow was visible in the skies over the rural plains of eastern Alabama nearly 30 miles away. When he announced the purchase, Auburn Athletic Director Jay Jacobs said the new board would help recruit star athletes and sell tickets. This convinced Auburn’s board of trustees to approve the $13.9 million expense even though the athletics department posted a deficit of more than $17 million the previous year, an analysis of financial records shows, one of the worst fiscal years in Auburn athletics history. Some schools archive them, some don’t. Some syllabus archives are public, some aren’t. Some faculty members treat their syllabuses as trade secrets, others are happy to post them online. Despite the bureaucratization of higher education over the past few decades, syllabuses have escaped systematic treatment. Until now. Over the past two years, we and our partners at the Open Syllabus Project (based at the American Assembly at Columbia) have collected more than a million syllabuses from university websites. We have also begun to extract some of their key components — their metadata — starting with their dates, their schools, their fields of study and the texts that they assign. income disparities between those who have a college degree and those who don’t have been growing bigger and bigger for decades. But college graduation rates in the United States have slowed down, especially among kids from low-income families. As recently as in the mid-1990s, the United States had the highest college graduation rate in the world. Today, its rank has slipped to No. 12, in large part because college costs have skyrocketed. It’s no surprise, then, that more students rely on community colleges as a way to save money: 1.7 million students enroll each year, and about 80 percent say they want to go beyond earning an associate’s degree or a vocational certificate by finishing with a college diploma in their hands. In the 2013-14 academic year, at least 46 percent of all students who earned college diplomas went to community colleges, and a new report published on Tuesday found that some states do a much better job than others at getting their students to graduate. As the new year begins, millions of people are vowing to shape up their eating habits. This usually involves dividing foods into moralistic categories: good/bad, healthy/unhealthy, nutritious/indulgent, slimming/fattening — but which foods belong where depends on whom you ask. The U.S. Dietary Guidelines Advisory Committee recently released its latest guidelines, which define a healthy diet as one that emphasizes vegetables, fruits, whole grains, low- or nonfat dairy products, seafood, legumes and nuts while reducing red and processed meat, refined grains, and sugary foods and beverages.1 Some cardiologists recommend a Mediterranean diet rich in olive oil, the American Diabetes Association gives the nod to both low-carbohydrate and low-fat diets, and the Physicians Committee for Responsible Medicine promotes a vegetarian diet. Ask a hard-bodied CrossFit aficionado, and she may champion a “Paleo” diet based on foods our Paleolithic ancestors (supposedly) ate. My colleague Walt Hickey swears by the keto diet. Recent research on hunger at colleges opens serious questions about those assumptions. Sara Goldrick-Rab, a professor of education policy and sociology at University of Wisconsin, last year surveyed 4,000 students at 10 community colleges across the country, including Delgado Community College in Louisiana, Essex County College in New Jersey, and Western Wyoming Community College. Her study, published in December, suggests that more than half of all community-college students struggle with food insecurity. A combination of this “carry anywhere” device and a global information utility such as the ARPA network or two-way cable TV, will bring the libraries and schools (not to mention stores and billboards) of the world to the home. One can imagine one of the first programs an owner will write is a filter to eliminate advertising! Alan Kay quietly helped invent the future through sound reasoning, a strong philosophy, and unabashed dreaming. He worked as a top researcher at institutions such as Xerox PARC, Atari, Apple, Disney, HP, and Kyoto University, resulting in contributions that range from object-oriented programming to child learning tools, where he continues his research today. The Pythagorean Theorem: This theorem is foundational to our understanding of geometry. It describes the relationship between the sides of a right triangle on a flat plane: square the lengths of the short sides, a and b, add those together, and you get the square of the length of the long side, c.
This relationship, in some ways, actually distinguishes our normal, flat, Euclidean geometry from curved, non-Euclidean geometry. For example, a right triangle drawn on the surface of a sphere need not follow the Pythagorean theorem. On the one hand, he’s supposed to be called by some combination of the two vocations Max Weber set out in his lectures in Munich: that of the scholar and that of the statesman. Neither academic nor activist but both, the public intellectual is a monkish figure of austere purpose and unadorned truth. Think Noam Chomsky. Intellectual need, a key part of the DNR theoretical framework, is posited to be necessary for significant learning to occur. This paper provides a theoretical examination of intellectual need and its absence in mathematics classrooms. Although this is not an empirical study, we use data from observed high school algebra classrooms to illustrate four categories of activity students engage in while feeling little or no intellectual need. We present multiple examples for each category in order to draw out different nuances of the activity, and we contrast the observed situations with ones that would provide various types of intellectual need. Finally, we offer general suggestions for teaching with intellectual need. 1. In 2014-15, 3,660 students were identified as advanced learners in grades K-8, accounting for about 19% of all K-8 students. 2. The demographic diversity of the students identified as advanced learners increased from 2013-14 to 2014-15 by race/ethnicity, income, and English Language Learner (ELL) status. 3. Advanced learners exhibit higher attendance rates, lower incidence of negative behavior, and higher proficiency rates than their peers, as well as higher MAP growth rates. Superintendent Cheatham’s related memorandum (PDF). Background: The “Talented & Gifted” Complaint. One size fits all classes: English 10. Past attempts to reduce high school curricular choices. Adding to the complexity are methodological changes by the ABA. It used to separate “full-time” tenured and tenure-track faculty from “other full-time” faculty, such as clinicians. In 2014, it did not separate those categories, but it also yielded a fairly significant one-year decline in that category, suggesting confusion or misreporting of data. And further adding to the complexity are seemingly-random fluctuations in faculty sizes from year to year, or stark differences between fall and spring terms, likely because the data is not serious accounted for and leaves errors. College Board, a testing firm based in New York, has cancelled college entrance exams planned for Saturday in the Chinese mainland and Macau due to cheating concerns that some students may have seen copies of the exam. “The decision is based on evidence that some students have been exposed to test materials intended for this administration,” according to the email received by education agencies and test applicants who post in the China’s social media Sina Weibo. The email was sent on Thursday, and said it will update students with details about a makeup test next week. Stacy Caldwell, College Board’s vice president for college readiness assessment, said the makeup test will probably be scheduled in a month or so, according to Associated Press. Hong Kong test centers are not affected. The mainland Chinese students usually take the tests in Macau and Hong Kong. Children’s engagement in music practice is associated with enhancements in literacy-related language skills, as demonstrated by multiple reports of correlation across these two domains. Training studies have tested whether engaging in music training directly transfers benefit to children’s literacy skill development. Results of such studies, however, are mixed. Interpretation of these mixed results is made more complex by the fact that a wide range of literacy-related outcome measures are used across these studies. Here, we address these challenges via a meta-analytic approach. A comprehensive literature review of peer-reviewed music training studies was built around key criteria needed to test the direct transfer hypothesis, including: (a) inclusion of music training vs. control groups; (b) inclusion of pre- vs. post-comparison measures, and (c) indication that reading instruction was held constant across groups. Thirteen studies were identified (n = 901). Two classes of outcome measures emerged with sufficient overlap to support meta-analysis: phonological awareness and reading fluency. Hours of training, age, and type of control intervention were examined as potential moderators. Results supported the hypothesis that music training leads to gains in phonological awareness skills. The effect isolated by contrasting gains in music training vs. gains in control was small relative to the large variance in these skills (d = 0.2). Interestingly, analyses revealed that transfer effects for rhyming skills tended to grow stronger with increased hours of training. In contrast, no significant aggregate transfer effect emerged for reading fluency measures, despite some studies reporting large training effects. The potential influence of other study design factors were considered, including intervention design, IQ, and SES. Results are discussed in the context of emerging findings that music training may enhance literacy development via changes in brain mechanisms that support both music and language cognition. I just have to get it off my chest. I haven’t told many people because they either wouldn’t understand, or they wouldn’t respond correctly and neither is sufficient for this moment in my life. The picture above is what I looked like after crying for a day – this is what the cancelling of a contract looks like. See, my contract was cancelled. No biggee, right? Part of the deal of being an adjunct – we all *know* it’s precarious. Why should I be in any less of a precarious spot than the next person? But it flattened me in a way I’ve never been before. See, that contract had been signed – one class for spring semester. Down from three, then two, but still with the one class I’d picked up at the neighboring school, we could afford daycare and we’d make it another semester. Summers are always tough, but we’d cross that bridge later. First, food in the mouths for Winter and Spring, and bills and rent… And after the contract was signed, we bought Christmas presents and I was settling in to my state of obliviousness just fine. Why, I even got myself a couple of Christmas gifts – some sweaters from Target and matching Pjs for Christmas eve. The study’s initial results suggest that one can prove that a liberal arts-style education can be associated with greater odds, compared to others with bachelor’s degrees, on such qualities as being a leader, being seen as ethical, appreciating arts and culture and leading a fulfilling and happy life. Detweiler said he wanted to look at characteristics of the undergraduate experience and didn’t want to rely on whether graduates would identify their colleges as liberal arts institutions or not. First, he obtained a sample of 1,000 college graduates — some from lists of liberal arts colleges’ alumni and others from a random sample of the population of college graduates in the United States, a group in which liberal arts graduates are a minority. The sample was divided into groups of those 10 years, 20 years, and 40 years after graduation. Those in the sample were then asked a series of questions about their undergraduate educational experiences and about their lives since college. Marvin Krislov, the president, said that while some of the demands “resonate with me and many members of our community, including our trustees,” he would not respond directly to the proposals from black students, which were termed non-negotiable. I’ve followed discourse about Newark’s public education system for years and, suddenly, there’s a shift. While education politics and policy is typically overheated in New Jersey’s largest school district – decades of corruption and nepotism, extreme poverty, failing schools – there’s a new momentum thrumming through a parent-driven crusade for public school options. A new group called Hands Off Our Future Collective is drawing more and more families to meetings with legislators and school board members. Eric Dawson of “The Newark Report,” a Newark native is unabashedly exposing Mayor Ras Baraka’s duplicitous campaign tactics against school choice. A universal enrollment system that simplifies choice among traditional and charter public schools methodically quantifies parent desire for alternatives. Superintendent Chris Cerf has successfully smoothed some ragged edges from Cami Anderson’s tenure and restored leadership. The scholarly paper which first put autism on the map as a recognisable diagnosis listed Donald as “Case 1” among 11 children who – studied by Baltimore psychiatrist Leo Kanner – crystallised for him the idea that he was seeing a kind of disorder not previously listed in the medical textbooks. He called it “infantile autism”, which was later shortened to just autism. Teachers have complained about over-crowded classrooms, poor school conditions, and dissatisfaction with the idea of charter school growth in Michigan. The teachers’ sick-out includes a planned march, which will conclude near a venue being visited by President Barack Obama Wednesday. Meanwhile, 46,000 kids are unable to attend school in Detroit. Among those 46,000, it’s likely that less than 4,000 of them can read proficiently. It’s difficult to overstate how crushing America’s student loan debt situation is. The amount of money adults in the US owe due to educations is over $1.3 trillion and jumps up by more than $2,000 every second. The average borrower owes $28,000, though some owe much more than that. Many former students, trapped between low wages and the high cost of education, can barely afford to keep up with interest payments, let alone start paying off the principal. Some people are put in so desperate a spot they have attempted to bail on their loans by fleeing the country and hiding out from the banks and collection agencies that will inevitably start looking for them. For nearly two decades the Tax Foundation has published an estimate of the combined state-local tax burden shouldered by the residents of each of the 50 states. For each state, we calcu­late the total amount paid by the residents in taxes, then divide those taxes by the state’s total income to compute a “tax burden.” We make this calculation not only for the most recent year but also for earlier years because tax and income data are revised periodically by govern­ment agencies. The handy Australianism “no worries”—usually used in place of “you’re welcome”—has been burrowing deeper into the heart of American English. According to the Corpus of Contemporary American English, a free, 450-million word trove assembled by Brigham Young University’s Mark Davies, the phrase has been popping up in stateside lingo with increasing regularity. Usage of the phrase rose to 1.5 per million words in 2011.
ranked Rutgers University as the 73rd most “militarized university” in the nation. “Militarized” is a misnomer, referring not to the presence of a militarized police force or an expansive ROTC program, but to the existence of national security programs, the amount of federal funding received by the universities and the presence of research relating to homeland security. Vice held Rutgers as one of the top homeland security schools, likely due to the growth of the Rutgers Institute of Emergency Preparedness and Homeland Security (IEPHS). The threats experienced by New Jersey have been numerous. Wealthy families should apply for college financial aid too. January is an important time for families to complete the Free Application for Federal Student Aid, or Fafsa. Jan. 1 was the first day people could file this U.S. Education Department form for the 2016-17 academic year and with some types of assistance filing early may increase the amount students will receive. Last year was a tumultuous one for Yale University which, once again, found itself in the limelight not for its educational success or scientific breakthroughs, but rather for its political insularity and its willingness of students and perhaps administrators as well to subordinate free speech to a political agenda. What if students were asked to design their own high schools from the ground up? What if they had a strong voice in what they studied and how? And what if they had a say in how the school day was structured? That’s exactly what happened with two small, experimental high schools in Providence: 360 High School, located within the larger Hope High School, and Evolutions, located within Mount Pleasant High School. Early in my undergraduate years at Dartmouth College, I signed up for a French theater course. I remember waiting in the auditorium with the rest of the class, a large one by the standards of our small liberal-arts school. It was a few minutes past the scheduled starting time, and everyone scanned the room looking for the professor. Suddenly the lights dimmed and a booming voice emerged from the back of the room, growing louder while reciting a passage from Jean Anouilh’s Antigone, the classic French rewriting of Sophocles. Clad in a black cape, our professor, then in his 70s, nimbly climbed over seats and acted out the scene in the aisles, inviting giggling students to stand and become players in the unfolding scene. Finally this man, already larger than life, swept up to the stage at the front of the room and drew back his cape, delivering a breathless “Bienvenue au théâtre!” to his newly found apprentices. We broke out into applause, laughing and stunned in equal measure. This would be no ordinary French class. In John Rassias’s classroom, language was an experience of the mind and body, meant to be lived and breathed. We built Project Alexandria, a book exploration engine. Unlike standard recommendation engines, we don’t just list books you may like. Rather, we let you explore a rich book landscape and highlight how books are related. Many academics feel overworked and exhausted by their jobs. But there is little evidence that long hours lead to better results, while some research suggests that they may even be counterproductive. The research on how long academics work is patchy, but on the whole it shows that scholars are putting in longer hours than the average worker, and certainly more than the 9-to-5 norm that in any case seems to be disappearing from Western workplaces. A 1999 study by the US Department of Education found that full-time faculty clocked up 55 hours a week. A survey 15 years later at Boise State University in Idaho found an even more gruelling schedule: faculty worked an average 61-hour workweek, including 10 hours at the weekend. In its partnership with the Madison School District, the AVID/TOPS program works to narrow achievement gaps, helps students stay on track for graduation and prepares them for college. The program offers mentoring, tutoring, internships and college scholarships. How and why are scientific theories accepted? November 2015 marks the 100th anniversary of Albert Einstein’s general theory of relativity. This theory is one of many pivotal scientific discoveries that would drastically influence our understanding of the world around us. But how, and why, are these theories accepted – first by the scientific community, and then by the general public? To find out, let’s use Einstein’s relativity as a case study to examine how the theory was ultimately accepted and how scientists have made 20th century science as we know it today. We don’t know much about the brain. Scientists and researchers have poked and prodded parts of our most complex organ for centuries, giving names to the most obvious parts. But we still lack answers to fundamental questions, like what the brain does with most of its energy, or how diseases make neurons in the brain affect each other. Language about Islamic history in school textbooks is spurring battles across the nation, with some parents’ groups and lawmakers objecting to what they see as an overly benign portrayal of the religion’s spread and its teachings. Following recent attacks in the U.S. and abroad by terrorists who claim to espouse Islamic beliefs, more American parent groups have turned attention to what children are taught about the religion. Muslims and their supporters say the opposition to the textbooks amounts to fear-mongering and presents a distorted view of their faith. letting kids study Swift instead of Spanish may seem appealing. We all know computer programming is an important skill, so it would be nice if it was promoted from elective status in schools, and there are plenty of superficial parallels between code and natural languages: both come from large families, so picking up your eighth declarative programming language is a lot easier than learning your first; both have concepts of grammar, syntax and so on. Proctor found that ignorance spreads when firstly, many people do not understand a concept or fact and secondly, when special interest groups – like a commercial firm or a political group – then work hard to create confusion about an issue. In the case of ignorance about tobacco and climate change, a scientifically illiterate society will probably be more susceptible to the tactics used by those wishing to confuse and cloud the truth. Related: Connected Math and Reading Recovery. On his pending retirement, Matthews said, “I never thought this day would arrive, but I provide this notice knowing we have accomplished so much for MTI members, that while I leave with a heavy heart it is one filled with great satisfaction.” He added that he would remain available to MTI whenever his advice or assistance is needed; that he will continue to help individuals however he can; and that he will continue to be active in social justice. Throughout his life Nietzsche thought of himself as an educator, but the time he spent working in higher education was not long and much of it he found frustrating. Appointed professor in classical philology at the University of Basel in 1869 when he was only 24 years old, he was seen as a prodigy with a brilliant career ahead of him. However, he left academic life in 1878, due to his worsening health and increasing disillusionment with institutionalised scholarship. The writings for which he is most remembered were written in the following decade, which he spent wandering restlessly around Europe. Then, in 1889, he suffered a disastrous mental collapse from which he never recovered. Until his death in 1900 Nietzsche remained a mute invalid under the guardianship of his sister Elisabeth, a repulsive individual with whom he quarrelled bitterly when she married an antisemitic high school teacher, Bernhard Förster, and accompanied him to found an “Aryan” colony, Nueva Germania, in Paraguay. Following the failure of the fly-blown settlement and the suicide of her husband, Elisabeth Förster-Nietzsche continued promoting racist ideas by seizing control of her helpless brother’s writings, establishing a Nietzsche Archive and methodically deleting passages in which he lambasted the “race swindle”. For this service she was duly rewarded. On the basis of a highly selective biography and a heavily redacted compilation of Nietzsche’s writings that she published under the title The Will to Power, she was several times nominated by admiring German academics for the Nobel prize in literature. When she died in 1935, Hitler attended her funeral. In October 2013, I launched freshStart, an anonymous social networking website for my high school. The premise was simple. Hunter College High School is a small school that starts in 7th grade. By the time you’re in 9th grade, you already pretty much know your entire class. However, these impressions are based on what people were like in middle school. I don’t think I need to elaborate on why that’s a problem. The solution I came up with was an anonymous social networking site exclusively for Hunter students. You sign up, enter your gender, grade, and genders and grades (9–12) of people you’re interested in talking to. You’re then randomly paired with someone who meets these criteria and given a chat interface, with both parties anonymous unless they choose to reveal themselves. This gives you the opportunity to make a second first impression. In short, it was Omegle for Hunter Students plus an appealing elevator pitch. In the Aaron Sorkin version of the story, I created freshStart because I was dissatisfied with my high school romantic situation. He would not be completely wrong on that one. Why Are There So Few Black Children in Gifted Programs? Fragility has become a characteristic of children and teenagers to an extent unknown 25 years ago. That’s what I’m seeing in the office today – and what I did not see in the office years ago. But besides my observations and experience as a physician over the past quarter-century, several lines of evidence support my claim. The first and most obvious evidence is the extraordinary rise in the proportion of young people diagnosed and treated today for anxiety and depression. News consumers are often unaware of how much of what they read is dominated by – and may, in fact, be simply a minimal re-write of – PR news releases written by people whose job it is to make their institution, their faculty, their ideas, their research or their products look as good as they possibly can. Today, probably more than ever, many supposedly independently-vetted news stories are actually just mirror images of PR news releases. Such is the case with his latest work. At a quiet table in the cavernous Hawksmoor Seven Dials, a branch of the high-end restaurant chain in central London, where the decor is brown and the meat is red, Fryer tells me how he spent two days last year on the beat shadowing cops in Camden, New Jersey. (On his first day on patrol a woman overdosed in front of him and died.) What Fryer wanted to figure out was whether the killings of Michael Brown and Eric Garner — two African-Americans whose deaths led to widespread protests — were part of an observable pattern of discrimination, as activist groups such as Black Lives Matter have suggested. After his week on patrol, he collected more than 6m pieces of data from forces such as New York City’s on cases of blacks, whites and Latinos being victims of police violence. The graph he passes between the salt and pepper displays his provisional findings. The horizontal axis is a scale of the severity of the violence, from shoving on the left all the way to shootings on the right. The curve starts high, suggesting strong differences in minor incidents, but descends to zero as the cases become more violent. In other words, once contextual factors were taken into account, blacks were no more likely to be shot by police. All of which raises the question: why the outcry in 2014 in Ferguson, Missouri, where Brown was shot? “I think it’s about incentives and rewards,” Fryer adds. Officers, he explains, are often given the same rewards regardless of the severity of crimes they address, and because they are not punished for using “lower level force” without proper cause, it encourages aggressive behavior. < “I never believed that going to jail is cool”, he says. It was a sports scholarship (his athletic frame hints at his past as a college American footballer) that took him from a “bad school” to the University of Texas, where he first came across the study of economics. “My grandfather didn’t have much education,” Fryer goes on. “He used to talk in riddles. He’d say little things to me, he’d say, ‘Boy, you start out life with a 10, and you grow up in poverty, let’s take three away. And if you go to bad schools we’ll take another three away. And if you’re brought up by a single mom we’ll take another three away. But you know what’s left? Dignity.’ ” “This is why I can use my own experience,” he says. His past gives him ideas for what theories to test, but only through the data can he reach firm conclusions. “I know the danger of taking away people’s dignity.” But “experience alone doesn’t help us design policies that will work”. ..... As the starters arrive, we turn from his work on criminal justice to Fryer’s focus: education. His first working paper — co-authored with Steven Levitt of Freakonomics fame, and published in 2002 before he completed a PhD at Penn State University — sought to explain the “black-white test score gap”, or why black pupils on average do worse at school than whites. To make a somewhat crude distinction, at the time there were broadly two interpretations for the test-score gap. The first, commonly found on the left, was that it was all down to poverty: African-Americans were more likely to be poor and therefore were less likely to do well in school. The second account, more popular among conservatives, pointed to rates of “family breakdown” among African-Americans. .... Fryer’s first and subsequent papers transcended those interpretations by showing the importance of schooling to inequality — in effect, that black kids did worse because they went to bad schools. Conversely, Fryer hypothesised, perhaps great schools could close the gap. Many visits to high-performing charter schools — those relatively free of local government control — and terabytes of data later, he arrived at five common features of a good school: an extended school day and year; the use of data by teachers; a culture of high expectations; small-group tutoring; and a “devotion to high-quality human capital” (well-qualified teachers). ..... He wants to try “education learning accounts”: giving money directly to parents to spend on their child’s education (with more money given to the poorest parents). And he is wrapping up work on how to improve attendance at vital early-years education by giving parents cash incentives, as has proved effective in similar cases in countries such as Mexico. ..... He says he agrees with much of what the president has done through his Race to the Top initiative, which has incentivised the type of charter schools commended by Fryer’s research, often in the teeth of opposition from local governments and teaching unions, which are also influential forces upon the Democratic party. Fryer says that half of the “dropout factory” schools have gone under Obama’s watch. “I’m worried that in the next education bill we’re going to be moving backwards, not forwards.” Hillary Clinton, previously a proponent of charter schools, has heaped criticism on them as she has come under pressure from Bernie Sanders. It’s hard to find agreement on much that ails the Minneapolis Public Schools, but few would disagree that the district is deeply troubled. Saddled with the poor governance of a chronically discordant board, lagging achievement, deteriorating internal systems, discipline issues, and waning public confidence, it’s hard to see how we will ever return to schools that Minneapolitans can be proud of supporting. One thing is for sure, there is no hope of turning the district around without strong leadership, and that makes recent reports about the failed process of selecting the next superintendent concerning. It was June, 2006. The place was the Adult Learning Center at the Aguilar branch of the NYPL on 110th Street near Lexington, where more than a hundred students and twenty-five volunteers met regularly to study together. Around a table, small groups of students met with one or two volunteers for four hours each week, and built their reading and writing skills together in a relaxed, informal setting. Awa’s spoken English was poor, but her desire to learn was clear. She had had only a few months of education in Gambia before coming to the US to start a new life here. Catholic Charities had helped her with housing, food, and schools for her kids, and then sent her to the library so she could learn how to read. They knew that her low literacy put a ceiling on her prospects to survive in NYC. 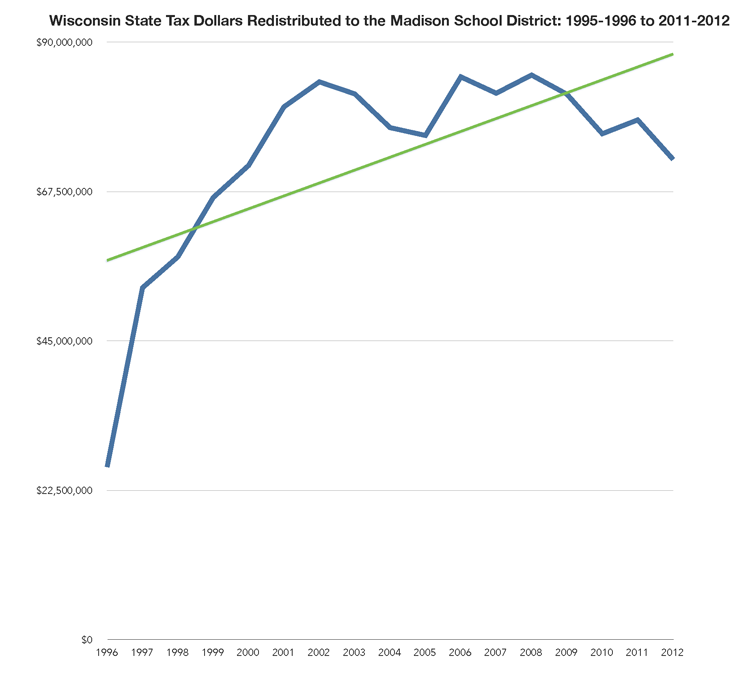 Related: Madison’s long term, disastrous K-12 reading results. The beginning of January is prime time for making resolutions to improve one’s fitness and health. But maintaining a healthy lifestyle isn’t as simple as burning holiday calories. Our socioeconomic class, combined with where we grow up and where we currently reside, structures everything from our education to our income to our employment opportunities—and now our fitness as well. More older people are finding themselves facing a change of career later in their working lives, and some may choose to intern to help them move into a new role. They must handle their unusual amount of career experience tactfully if they want to ensure things go smoothly with a much younger boss and colleagues. There are challenges for interns over the age of 40, says Ben Lyons, co-founder of Intern Aware. “Managers may feel uncomfortable about hiring someone older than them,” he says. The number of older interns has been growing, he adds, because people are working for longer and are having to pick up new skills to enter new industries. However, older people might be put off from applying because the role tends to be associated with students or people in their 20s, he adds. While interns may be expected to do tasks that might be seen as menial — administration or making tea — he says that interns are increasingly expected to do work that has real business value. Mr Lyons’ advice to older interns is for them to explain to their new boss that they are keen to learn and that they want to understand the industry that they are making a transition into. “They are cruel, they are despicable because those who are together with the cruel are themselves cruel. People who are [in solidarity] with those who commit massacres are guilty of the same crime,” Erdoğan told reporters after Friday prayers at İstanbul’s Sultanahmet Mosque, also known as the Blue Mosque, which was the site of a suicide attack that killed 10 German tourists on Tuesday. At least 12 academics who signed the petition this Monday as part of the “Academics for Peace” initiative were detained on Friday after prosecutors launched an investigation on the grounds of “insulting the state” and spreading “propaganda for a terrorist organization.” Dozens of them have also been suspended from their posts after Erdoğan railed against them in a speech on Tuesday.